Surprisingly, considering the enormous amount of international media focus on the issue, crude traders on Thursday weren't overly concerned with potential fallout over Venezuela's socialist government on the verge of collapse; instead, their attention was said to be mainly on rising U.S. inventories, which somewhat dampened their enthusiasm over global production cuts, resulting in a modest rise for U.S. oil. 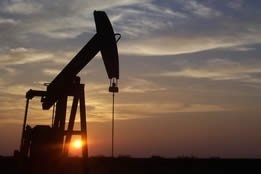 West Texas Intermediate rose by 51 cents to settle at $53.13, while Brent lost 3 cents to $61.12 per barrel, after Energy Information Administration data showed that crude inventories rose by 8 million barrels in the week ended January 18, compared with analysts' expectations for a decrease of 42,000 barrels. John Kilduff, founding partner at Again Capital, noted, "The report was rather bearish, punctuated by the large crude oil inventory increase,"
Phil Flynn, senior market analyst, Price Futures Group Inc. However, although the sudden escalation in tension between Venezuela and the U.S. didn't seem to spook investors as much as some analysts had predicted, that will likely change very soon, according to Helima Croft, global head of commodity strategy at RBC Capital Markets. She pointed out that RBC has already forecast an additional drop of 300,000 to 500,000 barrels per day (bpd) from Venezuela in 2019, and if Trump okays energy sanctions in a bid to side with the Venezuelan populace and force president Nicolas Maduro out of office, it could result in a loss of several hundred thousand more barrels - thus putting additional strain on global supplies of certain crude grades. One thing is fairly certain: the crude market will likely remain volatile for the foreseeable future, and with that in mind, Majid Jafar, CEO of the United Arab Emirates-based Crescent Petroleum, told the World Economic Forum in Davos that prices should sit around the $60 to $80 per barrel range throughout 2019: "[Prices are] the most volatile in 30 years: that's partly because of certain tweets but also because there isn't much spare capacity, and that's where you see volatility." Jafar, who differs from the analytical community with his belief that a trade deal between the U.S. and China will be ratified soon and that the global economy is still growing "pretty well," added that "$90 is more likely than $40." But as if to illustrate how tenuous such predictions are, Bloomberg pointed out that difference this week between the change in U.S. stockpiles suggested by an industry report and data from the federal government was about 1.5 million barrels. The news agency stated that this is "actually the closest the American Petroleum Institute and the U.S. Energy Information Administration have been in their reports in almost two months.......welcome to the whiplash world inhabited by America's oil traders, who depend on the reports that arrive just a day apart to determine the price they pay." Phil Flynn, a senior market analyst at Price Futures Group Inc., conceded, "The EIA is from Mars and API is from Venus; [nonetheless], "you can't ignore the data from API: it can move the market."